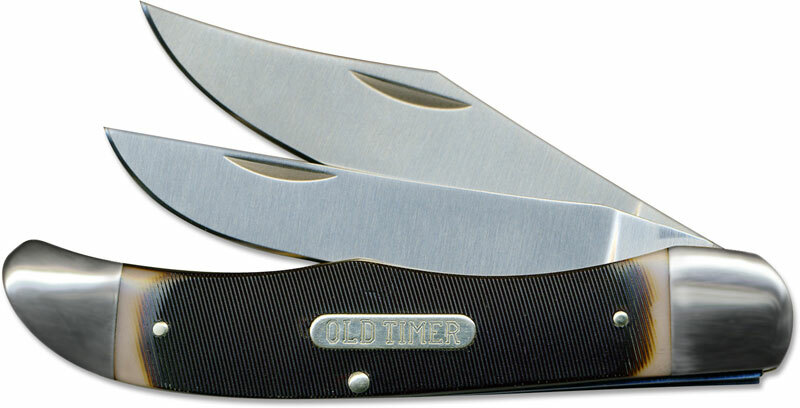 The illustrated Old Timer Knife is the Folding Hunter Old Timer Knife that features clip and skinner blades made of stainless steel. The sawcut brown Delrin handle of this Old Timer knife, 5 1/4" closed, has brass liners, Old Timer shield and nickel silver bolsters. A genuine leather sheath is included. This Folding Hunter Old Timer Knife is imported. In my opinion Taylor Brands, LLC has secured a decent Chinese manufacture of once made too proud can't pay your wage USA knives. Skeptical at first, but once in my hands, the quality is that of the originals I bought decades ago. Yes the Chinese have capitalized on counterfeit, but US has fostered that demand with internet ready entrepreneurs lusting gain oblivious to developed circumstance. Thanks KnivesPlus for putting together, yet another, well planned web site marketing quality imports which in design helps our international community make there recognition. I do only ask of one thing, instead of simply "Made in China", how about injecting a little pride into the label like Americans do and give a specific manufacture, trademark, or region. If you don't like imports, don't buy them and tell your fellow businessman to quit importing them. World commerce is one of the foundation blocks to providing recognition, equality, liberties, and quality of life to all souls. good quality. Taylor brand knives has secured a quality manufacture in China to make once made usa knife. If you didn't have an old one to compare you wouldn't know the difference. This knife is a very good built knife it is really nice looking ,plan to use it a lot for hunting its want of the best I seen.would recommend it to anyone who wants a good knife.